Convenient though Apple’s online media emporiums may be, one convenience they lacked was an easy way to share purchased apps, music, and books among family members. To share an app purchased by Mom with little Leonidas, you had to sign out of one iTunes account on the tot’s iPod touch, sign in with Mom’s ID, and download her copy. Thanks to iOS 8’s new Family Sharing feature, that may no longer be necessary. Here’s how the new system works. On a device running iOS, 8 tap Settings > iCloud > Set Up Family Sharing. A Family Sharing window appears that outlines the benefits of this scheme. Those benefits include the ability to share purchased music, movies, books, and eligible apps. (Currently, many apps are not yet eligible.) You can also share photos and videos in an automatically created Family photo stream; share your location with family members; schedule events in a just-as-automatically created Family calendar; and help family members find their missing devices. Tap the blue Get Started link to begin the setup process. In the resulting window, you are proclaimed the family organizer. With this power you can invite others to the Family Sharing account and pay for your and their purchases from the iTunes, iBooks, and App stores. The image and email address associated with your Apple ID account is shown here. If that’s not the account you wish to use, tap “Not [your name] or want to use a different ID?” You’re then told that you must go to iCloud Settings, sign out with the currently active Apple ID, and sign in with the one you wish to use. If you’re happy with the chosen ID tap Continue. As Family Organizer you wield the power (but also pay the bills). The resulting Share Purchases window informs you that you will soon share iTunes, iBooks, and App Store purchases made using the chosen account. Unless you impose restrictions on family members, they will be able to view and download all of your purchased content. Tap Continue to, well, continue. In the Payment Method window that appears you’ll see the credit card associated with your account. You’ll also be informed about the Ask to Buy option, where you can demand that child members get your permission before purchasing something from one of Apple’s online stores. (You can learn more by tapping the Managing Family Purchases link in this window.) Having digested this information, tap Continue once again. This window disappears and you’re now taken to the Family screen of iCloud settings. You’ll see your name as the Organizer with an Add Family Member link below. If you wish to create an ID for a child under 13, tap the Create an Apple ID For A Child link on the Family screen. This initiates the process of creating an account for the child. During that process you’ll be asked to enter the child’s birthday, agree to a Parent Privacy Disclosure form, enter the security code for the credit card associated with your Apple ID, enter the child’s first and last name, create a name for that account (in the form of example@icloud.com), create and verify a password for the account, answer three security questions, enable or disable the Ask To Buy feature (which is switched on by default), opt to share that person’s location, and agree to two sets of Apple’s terms and conditions. You can demand that kids clear their purchases with you. Do all this and the child is added as a family member. You’ll receive a notification of this via email and the child’s name will appear below yours as a family member. If you wish to restrict any content you share with your child you must do so on their device via restrictions found in Settings > General > Restrictions. Here you can choose to limit apps and media by rating or age. To add someone as a family member who already has an Apple ID, tap Add Family Member in the Family screen and in the Add Family Member window that appears enter the email address associated with their Apple ID in the To field and tap Next. In the succeeding window you can add a member by entering their Apple ID’s password after you tap the Ask This Person to Enter Password link. Otherwise you can choose to send them an email invitation. Joining a family group is only an invitation away. If you select the latter option, that person’s address will appear within the Family Members list with a small Invitation sent entry below. The person you’ve added will receive an email message inviting them to Family Sharing. To join, they tap View Invitation in the message. On their iOS device running iOS 8 this takes them to the iCloud Invitations screen where they can tap Decline or Accept. When they accept they can add a photo to their identity if one doesn’t exist and then tap Confirm to agree to be part of the family group. On an iOS device a Share Purchases screen appears where they enter their Apple ID and password to share the items they’ve purchased from Apple. They then agree to Apple’s terms and conditions, choose whether to share their location, and they then become a member in good standing of the group. Their status changes in the Family Members list to either Adult or Age X if they're under 13 years of age. Once you’ve added all the family members you care to (you can have up to six people in your family sharing group) you can then manage or remove them. To do so, tap on a member’s name. If you’ve tapped on a member who has an adult account versus a child account, you have the power to switch on a Parent/Guardian switch that grants that person the ability to approve Ask to Buy requests from children. This would let Aunt Vilma approve purchases from little JoJo when Mom’s on yet another globe-trotting adventure. And if it turns out that any one of your family members are on the outs as the result of a serious disagreement or an adult child leaves the basement because they’ve finally secured a job, you an easily remove them by tapping their name and then the Remove button. When you choose to remove them they will immediately lose all access to the family’s shared content and services. Shared apps will remain on their devices but they’ll have to pungle up if they wish to continue using them. You and your family, all accessible from a single Family screen. In the case of a child member, you can choose to enable or disable the Ask to Buy option. For instance, precocious Miffy is responsible enough at age 12 to choose what she wishes to buy rather than have to run to Cousin Jasper so he can grudgingly approve the purchase of yet another GTD app. Child members under the age of 13 can not be removed, but they can be transferred to a different family group. For example, young Master Charles has lived with Mumsy for the past two years, and now it’s Pater’s turn. To transfer Charlie to his father’s group, Dad must send an invite to join his family members. When Mother agrees (via a message on the Home screen of her device or within Settings > iCloud > Invitations), Dad agrees to the parental consent form and provides a security code for the credit card associated with his account. Chuck is then removed from his mother’s group and transferred to dad’s. Child members over the age of 13 have the ability to declare their independence once they come of age. Because you had to enter their birthday as part of the setup process, their device knows when they’ve crossed the line that separates pre-teen and teenager. When that day arrives they can choose to leave the family group by tapping Settings > iCloud > Family, tapping their name, and then tapping Leave Family. You as family organizer also have the choice to disband the group altogether. To do that, tap your name on the Family screen and tap Stop Family Sharing. You will keep the family calendar, reminders, and shared photo albums that were once shared with the family, but family members won’t have access to them nor will they be able to track your location or use Find My iPhone/iPad/iPod for your devices. And just as when someone leaves the group, they also lose the ability to use purchased apps (and in-app purchases made in free apps) as well as purchased media. They’re welcome to purchase their own copies of once-shared apps and media. Note that if you have a child member as part of your family group, you must transfer them before you can disband the group. As in real life, it’s not cool to leave under-age kids unattended. iOS 8’s Family Sharing is fairly flexible but it does have a few restrictions. As we’ve mentioned, you can have up to six members in a group. 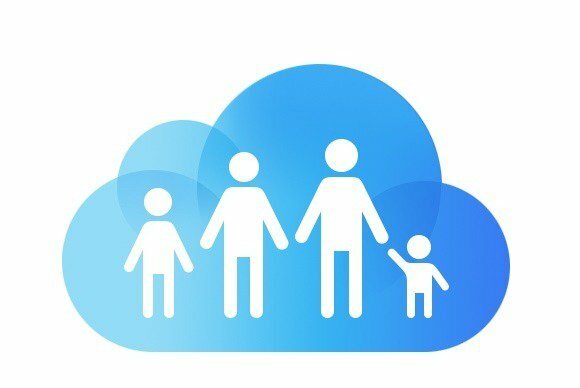 Each Apple ID can be associated with just one family group at a time. And you can switch between groups no more than twice per year. What once required countless workarounds and some clever configuration now demands just a few minutes of your time. When you’re finished you’ll better be able to plan family events, share and comment on photos taken by your kinfolk, treat the family to eligible apps and media with a single purchase, and find out if Sheila was telling the truth when she said she’d stopped hanging out with Biff two whole weeks ago. If you have a family laden down with iOS devices, Family Sharing is something you should explore.